I decided late in 2008 that I needed a laptop. I waited until just after Christmas, December 27, to be exact. I purchased an HP HDX 16t online for $993.00. The PC was customized slightly and arrived to me on December 30 from China! Needless to say I was impressed. I have been impressed with this unit ever since I first used it. There isn't much more you would want in a laptop. Other than its weight (a little over 6 pounds) there are no drawbacks that I can find. The laptop came loaded with Windows Vista Home Premium x64. I now have a dual-boot installation of Windows 7 Home Premium x64 & Linux Mint KDE 8. Both OSes installed with no problems and all the drivers work great. 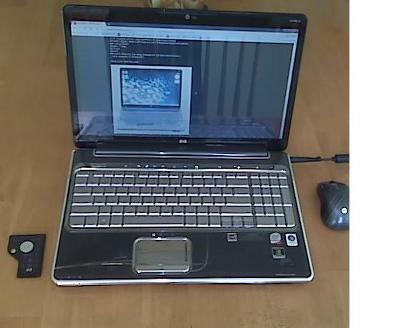 The system came with a 2.26 Ghz Intel Core 2 Duo w/ VT-x, model number P8400. It has more than enough processing power for me. This is one of Intel's early 45nm chips. The unit came with 4 GB DDR2 PC6400 Samsung brand memory, upgradeable to 8 GB. The hard disk drive is a 500 GB Seagate Momentus, which was also with the unit. The video card is an Nvidia 9600GT, powering an upgraded display - 1920 x 1080 panel. The worst thing about the laptop is that the sleep mode seems to lock up the computer rarely, which is a minor inconvenience most times. The keyboard is great, I love the keys and the full number pad is a lifesaver. The speakers aren't the loudest, but for a laptop they are pretty great. They are very clear and the built in subwoofer gives adequate bass response. The speed of the laptop is no drawback for me either. This thing powers through anything I can throw at it. Oh and the BLU-RAY drive, never got around to even using it but I burn a lot of DVDs. I never have problems burning DVD-R, +R, etc. If you want a fingerprint sensor, you're in luck, this model has it standard. I didn't know I would make use of it, but it is an excellent feature. Buy this laptop, really! It may be on sale now if you look hard enough. I imagine the new Intel Core i7 models that HP offers are just as enjoyable as this one was for me! I would definitely buy from HP again. This was the first laptop I purchased from them and I was very happy with it as you can tell.